The current hot rumor is that the LHC experiments ATLAS and CMS have seen, in the new 2012 data, very roughly what they saw last December in the 2011 data, at least as far as the signal from a Higgs decaying to two photons (particles of light) in the mass range of 125 GeV/c2. Note I am just repeating what I have seen on other blogs; as a matter of policy, I do not report secret information on this website, and I make no comment on the validity of any rumors. Suppose this were true; what would it mean? Well, it’s pointless to try to speculate about exactly how many standard deviations you would obtain by combining data in various ways — if I tried, the only thing I could guarantee you was that I’d get it wrong. So rather than kick arbitrary numbers around based on guesswork, let’s talk about the larger picture. There are two ways to think about the 2011 and 2012 data. One is to think about them as data sets you should combine together to extract the maximum information. That’s what you would ideally do if you had access to all of the data and knew all the subtleties about how to do this. It is not going to be that easy. Among many issues, one is that the data are taken at different energies, 8 TeV per proton-proton collision this year versus 7 TeV last year. So in combining them you are making a theoretical assumption about how the production rate for Higgs particles changes as you change the energy from 7 TeV to 8 TeV. That’s something you may or may not want to do, and at best it makes things rather complicated when you try to interpret the result. Another way to think about it, as I discussed last week — and I think this will turn out to be more useful as a rule of thumb — is that last year’s data was good for excluding the Standard Model Higgs particle over much of the range for its mass that was available before 2011. From a range of 115 to 800 GeV/c2 we’re now down, after 2011, to a range of something like 120 to 128 (where we can argue about the edges, but it doesn’t matter very much) or above 600. The hints we saw last year at around 125 GeV/c2 (see also here, here and here) were very interesting and suggestive, but weren’t convincing, in part because with such a large range of possibilities to explore, the possibility of such hints appearing by random chance was not that low. That’s due to the so-called “look-elsewhere effect”. One could only obtain high significance by combining lots of different low-significance measurements together, a technique which can be very problematic, especially when some of these measurements are very difficult. Now we come to 2012. The LHC experiments ATLAS and CMS have just about the same number of collisions so far in 2012 as they had in all of 2011; and since the energy is a bit higher, the production rate for Higgs particles should be a bit higher (by several tens of percent.) So what we’re going to see in the current 2012 data is a bit like a do-over of 2011… except that now the range of possible Higgs masses that needs to be explored is much smaller. The smaller range means that if the same hints were seen in the same place as they were seen in 2011, the probability of this happening in the search region by random chance would be much lower than in 2011. More precisely, this means the difference between the naive significance of any excess in the data, and the significance after accounting for the look-elsewhere effect, will not be very important. Look-elsewhere was a big effect in 2011; but after the 2011 results, it will not be a big effect in 2012. Thus (roughly) if you view the 2011 data as needed to narrow down the search region to a small window, you can roughly take the significance of any reported 2012 excess almost at face value. So suppose we did see hints in the 2012 data that roughly resemble those in the 2011 data? Then I think you’ll see most everyone agree that the evidence for something real in the data is pretty strong. Of course we’ll need to see this in both the ATLAS and CMS experiments to have full confidence, but let’s assume that’s the case. What would be next? First, is what’s being seen in the data a Higgs particle at all? Could it be something else? Second, if it is a Higgs particle, is it the simplest possible type of Higgs particle — the Standard Model Higgs particle — or is it something more complicated? I’ve described in some detail previously the strategy used to answer these questions, so I refer you to that article. Generally, I suspect that the July 2012 data won’t be enough (even if you did try to combine it with the 2011 data) to shed clear light on these questions. But the strong theoretical prejudice on the first question will clearly be that “what’s being seen is a Higgs particle of some type”; after all, the theory of the weak nuclear force requires there be something Higgs-like somewhere, and the Higgs in this mass range was predicted to show up first as a bump in the two-photon search. I don’t think you’ll find many people who will think it likely that it’s not a Higgs particle, though due diligence will of course be needed to make sure. The theoretical prejudice on the second question is much weaker, however; we really have no idea whether the Higgs is of Standard Model type or not. But it seems likely we’ll need the full year’s data set before we start making much progress on this crucial issue (though surprises are possible, if the Higgs is sufficiently different from a Standard Model-type Higgs). And indeed, even if the Higgs looks somewhat Standard-Model-Higgs-like by the end of the year, our knowledge will still be vague; through Phase 2 of the Higgs search, we’ll be continuing to address the issue for the rest of the decade, making more and more precise measurements of the properties of the Higgs, looking for any deviation from the Standard Model’s predictions. All of this assumes the rumors are correct. IF it is true that ATLAS and CMS see something of roughly the same size as last year, in exactly the same place in their plots, then that would mean that evidence for the existence of some type of Higgs particle in the 125 GeV/c2 range had firmed up considerably. And that would be Very Big News. Well — we’ll find out soon enough. Posts have been a bit rare due to overwork and travel, but I have a few things to say about the search for the Standard Model Higgs particle (the simplest possible form of the Higgs) at CMS, one of the two major Large Hadron Collider [LHC] experiments. Last week I focused on the big news from the Tevatron and from ATLAS (the other major LHC experiment involved in the Higgs search), because the changes in their results were much larger than those from CMS, partly because CMS had already analyzed all their data for all of the different types of Higgs decays, and also the changes at CMS were, on the face of it, rather small. However, the results at CMS have a significant effect on the overall picture, both negative and positive, and so deserve comment. 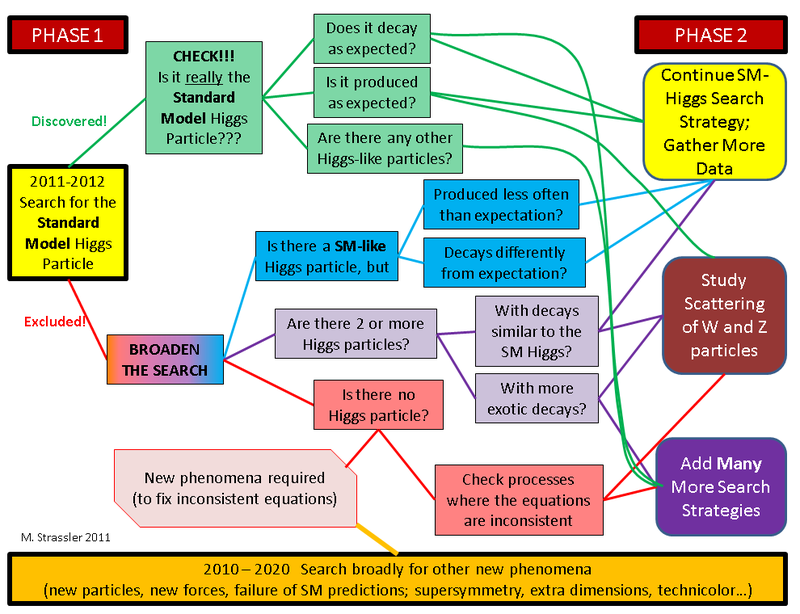 Taking Stock: Where is the Higgs Search Now? Today, we got new information at the Moriond conference on the search for the Higgs particle (in particular, Phase 1 of the search, which involves the search for the simplest possible Higgs particle, called the “Standard Model Higgs”) from the Tevatron and the Large Hadron Collider [LHC], the Tevatron’s successor. With those results in hand, and having had a little time to mull them over, let me give you a short summary. If you want more details, read today’s earlier post and yesterday’s preparatory post. Before I do that, let me make a remark. There is a big difference between healthy skepticism and political denialism. I get the impression that some people who are writing or reading other blogs misinterpret my caution with regard to experimental results as being somehow a political and unreasonable bias against the Higgs particle being present, either at a mass of 125 GeV/c2 or at all. That’s ridiculous. All that is going on is that I simply am not convinced yet by the data. I’m a careful scientist… period. And you’ll see that I’m consistent; later in this post I will advise you not to over-react negatively to what ATLAS didn’t see. What happened today at the Moriond conference? From the now-closed Tevatron, the CDF and DZero experiments presented their results, separately and combined, mainly focusing on the search for one Standard Model Higgs process, described in Tuesday’s post. From the LHC, CMS had already presented its main results from 2011 data on the Standard Model Higgs search, so there wasn’t much new from them. But there are three searches which CMS had presented in December that ATLAS had not (at least not with the full 2011 data). Today, ATLAS presented results on them all. 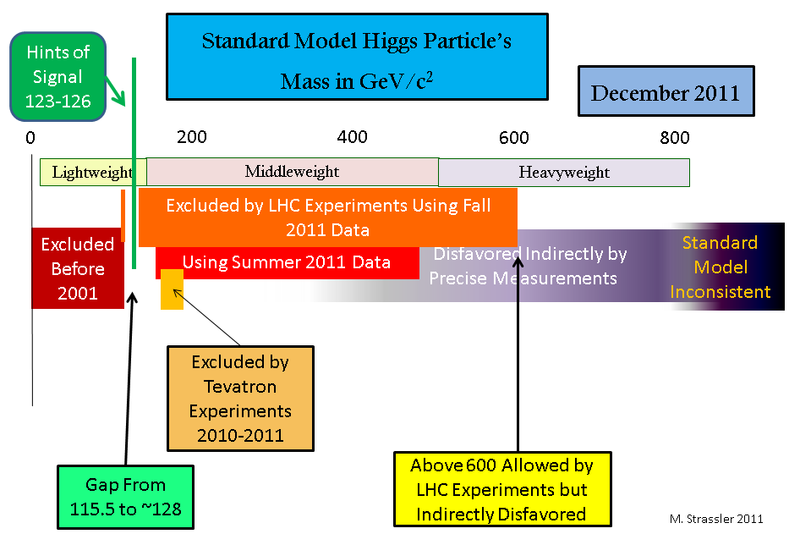 The Tevatron experiments see a combined 2.2 standard deviation [2.2 “sigma”] excess in their search, consistent with a Standard Model Higgs particle with a mass anywhere in the range of 115 to 135 GeV/c2. This is not inconsistent with the Higgs hints that we saw in December from the LHC experiments. Here I am being perhaps overly careful in not saying, more positively, “it is consistent with the Higgs hints…” only because this measurement is intrinsically too crude to allow us to narrow in on 124-126 GeV, where ATLAS and CMS see their hints. In short, the Tevatron measurement could, in the end, turn out to indicate a Higgs at a different mass than the one indicated by the current ATLAS and CMS hints. Anyway, it’s a minor and mostly a semantic point. The results from ATLAS were a bit of a shock. In all three processes on which ATLAS reported, CMS has presented results already, and in each case CMS saw a small excess (1 standard deviation [1″sigma”], which is small indeed.) But ATLAS reported today that it sees essentially no excess in any of the three, and even a deficit in one of them for low mass. This has a big effect. First, it allows ATLAS to exclude a Standard Model Higgs all the way up to 122 GeV/c2 (except for a little window 1 GeV/c2 wide centered at 118) and down to 129 GeV/c2. The only large window left for the Standard Model Higgs particle is 122-129, more or less centered around the hint at 126 GeV/c2 that they saw in December. But second, the significance of the December hint, when combined with the new data that shows no excesses in these three new processes, drops by about a full standard deviation. That’s a pretty big drop. I think it basically means, roughly, status quo. We got some positive information and some negative information today, and none of it is that easy to interpret. So I think we are roughly where we were before, except that we probably no longer have to worry about any Standard Model Higgs below 122 GeV/c2. Before today we had a decent hint of a Standard Model-like Higgs particle with a mass around 125 GeV/c2; we still have it. Let me explain what I mean. These are the three that ATLAS reported on today (where they saw no sign of a Higgs signal), and that CMS presented back in December (and saw a small excess in all three.) [ATLAS presented a result on the first one in December, but only using part of their data; it showed a small excess at the time, but not now.] The third process is the main one in which CDF and DZero reported an excess today, though the first one also plays a role in interpreting that excess. In other words, everything we learned today had to do with the difficult searches — the ones that are hard to perform, hard to interpret, and hard to check. And everything we learned was 1 or 2 sigma information; not very compelling even statistically. For the same reason, when I explained why I was skeptical of the evidence back in December, I told you that in my view the CMS excesses in the difficult searches did not make the case for a 125 GeV Higgs much more compelling. Since the easy searches at CMS do not show as large excesses as ATLAS’s do, I wasn’t really comfortable with the whole case from CMS. Their case improved in January, when they added a bit more information from their easy search for two photons. So as usual I advise patience and calm and no hyperventilating; the 2012 data will settle the issue. Either there is a Standard Model Higgs with a mass within a few percent of 125 GeV/c2 , or we’ll soon be fanning out in Phase 2 of the Higgs search, looking for all the other types of Higgs particles that might be out there. We’ve been expecting this: the ATLAS and CMS experiments at the Large Hadron Collider [LHC] are going to be making public shortly have made public the publishable form of their papers (preprints, which one submits to a journal for the purpose of peer review) on the search for the Standard Model Higgs particle (the simplest possible type of Higgs particle.) These papers are based on the preliminary results that we heard about on December 13th, which I discussed in some detail here. Here is a page where you can get all the ATLAS and CMS papers. Since we’re now approaching the time when the preliminary results from December on the search for the Higgs particle at the Large Hadron Collider (LHC) will be presented in final form, possibly with small but important adjustments, and since there will be additional results based on the fall’s data in the next few weeks, it would be good to do a little review of where things stand and where they’re going. I won’t do this all in one post but let’s get started. Fig. 1: From my guest post in Cosmic Variance: The basic logic of the Higgs search, showing Phase 1 in which the simplest form of Higgs particle (the Standard Model Higgs) is found or excluded, and the logical questions that will follow in Phase 2. See Figure 3 for a more complete version. If you’ve been noticing how slowly the discovery of the Higgs takes place — first there are hints, and only months later can one know whether those hints are real or not — then it will not surprise you to learn that the line between Phase 1 and Phase 2 isn’t sharp. The scientists at the LHC experiments ATLAS and CMS will be doing both of them this year, because they can, and because they should. We’ve got clear-enough hints for a Higgs particle with a mass of about 125 GeV/c2 (where c is the speed of light and GeV is defined here) to take seriously the possibility that it’s been found. If it’s been found, it resembles (only roughly so far, but that’s perhaps because there’s not enough data yet) an SM Higgs particle. All that remains to be done in Phase 1 is to close the window between 115 and 127 GeV/c2 , to confirm or refute the hints around 125, and push up the limits at 600 up as far as they can go, perhaps 800 and beyond. Fig. 2: Phase 1 of the Higgs search now leaves only a tiny window at small masses and a window at large masses that is disfavored by two decades of precision measurements. Notice how much progress was made in 2011 alone! So we can start looking ahead to Phase 2 — indeed we must. In particular, if there is indeed a new particle with a mass of 125 GeV/c2 that resembles an SM Higgs, then (from Figure 1) we now have to verify whether it is or isn’t exactly what the Standard Model predicts. Any deviation whatsoever from the precise predictions of the Standard Model would be a historic, game-changing, and Nobel Prize-deserving discovery! So the stakes are very high. Keep doing what we’ve been doing in the SM Higgs search (as described in the three articles here) but with more data. Specifically, if there is a new particle at 125 GeV/c2 we want to make sure that it is produced and that it decays as expected of an SM Higgs particle. Focus especially on production of the Higgs in the process (the second of five production processes described here) known as q q –> q q H, which involves the scattering of W and Z virtual particles (which aren’t really particles at all, but rather are more general disturbances in the W and Z fields.) This process is a very powerful test of whether any newly found particle is an SM Higgs particle or not. Look for something that shouldn’t be there if there is only an SM Higgs particle: exotic modes of production, or exotic decays, or a second Higgs particle. As I’ve not previously described the large class of searches required, I will write one or more articles about this soon. Fig. 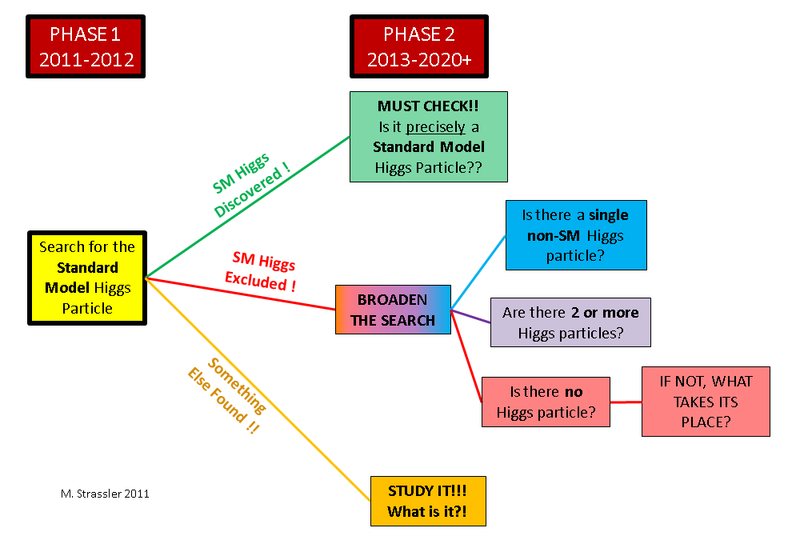 3: As Phase 1 of the Higgs search comes to a close, Phase 2 begins, with a series of logical questions and corresponding measurements. Even while the hints of a Higgs particle at 125 GeV are being checked with more data, studies of whether this might or might not be a Standard Model Higgs particle will be underway. On Tuesday, the New York Times had an article on the Higgs particle search. Not bad, and does quote relevant people, but just a little bit thin on content. If you want some actual content, try my article on the hints of the Higgs particle. The Higgs boson is the keystone and last undiscovered piece of the so-called Standard Model, a suite of equations that agrees with all the experiments physicists have been able to do so far in the laboratory. If the Higgs boson does not exist, theorists will have to go back to their blackboards. The Standard Model Higgs boson is the keystone and last undiscovered piece of the so-called Standard Model, a suite of equations that agrees with all the experiments physicists have been able to do so far in the laboratory. If the Standard Model Higgs boson does not exist, this will be very exciting for particle physicists, as it will imply (as has been known for decades) that there must be other particles — perhaps multiple Higgs bosons, and/or perhaps other types of particles — that physicists have not yet discovered, but should be able to discover with the LHC. The spin is pretty different. And then there’s the generic paragraph about supersymmetry — more or less right, but again with some big missing points. Well, stay tuned at this website for an article or two on supersymmetry, and what we have and haven’t learned about it from the LHC so far.